Since 1970, we have been helping golfers, swimmers, runners, and other athletes improve their flexibility with our Microfiber Reduction program. By releasing microfibers, a mild form of scar tissue, we can improve flexibility far beyond what stretching alone can do. Here are some actual before and after photos of some of our clients that show the improvement they received with our four-week Microfiber Reduction program. Microfiber Reduction even reverses the decline in posture that comes with age. 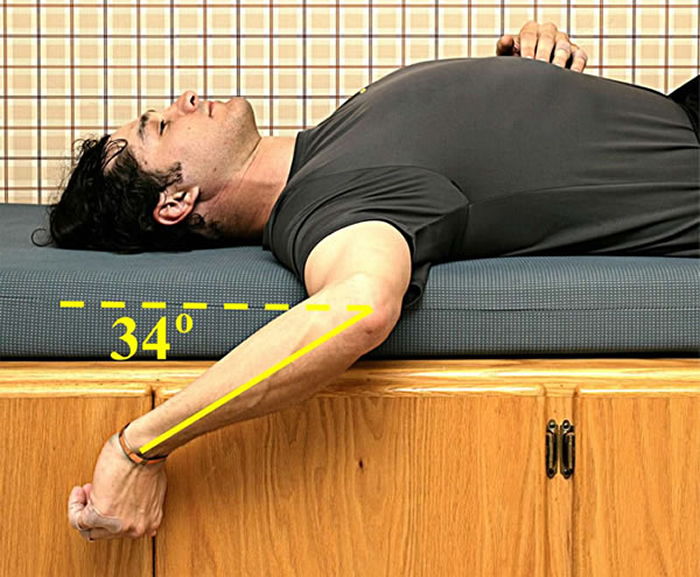 Many people spend frustrating years stretching, only to find that they quickly return to their original stiffness. The reason for this is that stretching only affects the muscles. Athletes who stretch but find that it offers no lasting benefit have developed microfibers, a mild form of scar tissue, in the connective tissue between their muscles. Microfibers form as a result of mild injury (impacts from football, hockey, soccer, baseball, basketball, skiing, etc. ), overuse (running, playing tennis, lifting weights, push-ups, sit-ups, etc. ), immobility (sitting behind a desk for 8+ hours a day, long airplane flights, etc.) and stress. This is why women are generally more flexible than men: they don't play contact sports when they are young. But if they do lift weights (as our female golfer above did) then they will also lose flexibility. Every one of the 600 muscles inside your body is surrounded by a thin membrane of connective tissue (which looks just like the skin around a sausage). Formerly, the purpose of these connective tissue membranes was thought to be to 'hold the muscles together'. But now we know that their purpose is to allow the muscles to slide past each other, which they have to do in order to stretch. Normally, the connective tissue membranes (white) between the muscles (red) are smooth. These membrane allow the muscles to easily slide past each other, which facilitates stretching and allows you to be flexible. But when you have even a mild injury (falls, sliding into base), overuse (lifting weights, running) or stress, microfibers form in between adjacent layers of connective tissue, binding them together as part of the healing process to immobilize the area. Microfibers are nature’s internal cast. Athletes who developed microfibers when they were young find that get stiffer with age and that stretching does not improve their flexibility. Golfers, tennis players, swimmers, runners and professional athletes who have lost flexibility usually blame themselves for their loss of flexibility. You might have said to yourself 'I don't stretch enough' or 'I don't stretch often enough'. Or, 'I would be more flexible if I was just more consistent with my stretching'. But it is not your fault that stretching does not help you. Stretching only helps those people, and those areas of the body, where there are no microfibers. The reason is simple. Microfibers are scar tissue--and scar tissue cannot be stretched out. Thirty-eight years ago, Bob Prichard, founder of Somax, made an amazing discovery during a group project for one of his pre-med classes. He saw a runner, who had a very stiff hamstring, suddenly gain another 20 degrees of movement in a few seconds. This was an athlete who had stretched his hamstring for years with no improvement. Prichard was determined to find out what produced this amazing increase in flexibility. His research led him to a dissection class to better understand human anatomy. During a discussion in medical school with his anatomy professor, when he described his work improving flexibility, the professor remarked that "You must be working with the connective tissue". This opened up a whole new area of study, as the connective tissue was thought to be 'unimportant'--as 'nothing' goes wrong with it. After years of study, Prichard finally determined that microfibers, a mild form of scar tissue, not only form inside the muscles (as is well-known to other researchers) as a result of injury and overuse, but in the connective tissue between the muscles as well. They form there to immobilize the area so that it can heal. They bind adjacent layers of connective tissue together so that the muscles cannot slide and stretch. They are nature's internal cast. Unfortunately, once the area has healed, the microfibers not only do not go away, they tend to accumulate over time, making people stiffer with age. He also discovered a genetic component to microfibrosis. A very small number of people form very few microfibers from injury or overuse. As a result, they can 'get away' with lifting weights and apparently not lose flexibility. Good examples are Tiger Woods and Annika Sorenstam. But weight-lifting and microfibers have finally caught up with them and they have both suffered injuries that have caused them to withdraw from golf. This is why professional athletic careers are so short these days. In the 'old days' before everyone lifted weights, athletes played long and well. Sam Snead in golf and Tom Seaver in baseball are two examples of long, productive careers. Microfiber Reduction releases microfibers that have formed as a result of injury, overuse, immobility and stress. For those who have stretched for years, only to find that they are no more flexible that before (or that their stiffness returns after a few days), Microfiber Reduction offers flexibility far beyond what stretching alone can do. Since microfibers are a mild form of scar tissue, once the microfibers are released, they are gone for good. You can form new microfibers if you take up contact sports, lift weights, run, or over-use your muscles. But most of our clients realize this and avoid playing hockey and football and just concentrate on their golf or tennis game. Strength is important, but bulk is not. Real strength is in the brain, not in muscles. 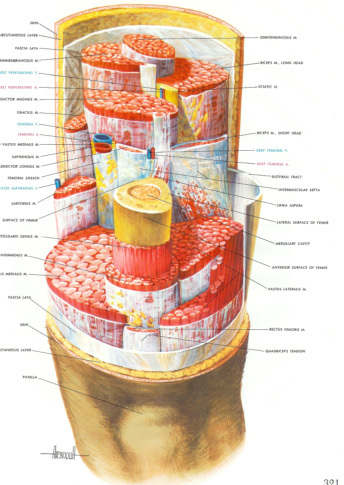 Each muscle is composed of tens of thousands of individual muscle fibers. Each one of those tiny muscle fibers is connected to the brain with its own, individual nerve. When you contract a muscle, your brain instantly calculates just how many fibers to fire. This process is called 'recruitment'. Your brain recruits the minimum number of fibers needed to get the job done. This is why you get stronger lifting weights. As the habitually recruited muscle fibers fatigue, your brain recruits additional fibers, and your muscles (actually your brain) get stronger. You also get stronger by tearing the muscle fibers when you lift weights. As the muscle fibers repair, they get bigger and stronger. But the biggest increase in strength really comes from your brain recruiting more muscle fibers. Unfortunately, when you tear muscle fibers, you create scar tissue, both within and around the muscles. This is what makes you stiff. It is what old-timers called 'muscle-bound'. Most of the work we have done with professional golfers, for instance, is undoing the damage caused by lifting weights. You can increase recruitment by using light resistance with lots of repetition. In this way, you can avoid tear and repair and just increase recruitment. But another way to increase strength is to increase your flexibility. Muscles bound up with microfibers cannot contract very well. And their opposing muscle (called the antagonist) does not stretch and let go, thereby inhibiting a successful contraction. We measure the strength of all of our athletes before we work with them. They all get stronger with Microfiber Reduction. The accumulation of microfibers is the main reason people get 'weaker' with age. It is not the loss of muscle mass, it is the loss of flexibility. This is why our golfers can increase their drives up to 40 yards. Their muscles are free to stretch and contract. They are no longer in a cast. Since many people who have microfibers and have found that stretching has not helped them, they often resign themselves to forever being stiff. If you don't release the microfibers you have, you won't be stiff for the rest of your life. You see, microfibers accumulate over time. This is why those who played contact sports when they were young, or overused their muscles with weights, push-ups, sit-ups, etc., find themselves stiff in their 40's, 50's, 60's, 70's and beyond. If you don't get rid of the microfibers you have now, you will be stiffer next year, and stiffer still five years from now. This is why doing nothing, or just continuing with your stretching program in the hope that it will eventually work, is not an option. Not if you want to continue to be active. Golf, tennis, swimming, walking are all forms of movement. Movement requires flexibility. The more flexible you are, the better you will be able to move. Those people who don't get rid of their microfibers eventually have to give up the sports they love. We breathe 17,000 times a day. Our brain uses four times more oxygen than any other part of our body. When you lose flexibility in your rib cage, you breathe less oxygen, and your brain is the first organ in your body to suffer. Do you know how you feel when you go for a long time without eating? You find that your thinking suffers. So you grab a bite to eat, and 20-30 minutes later, when the glucose (sugar) from that meal finally gets to your brain, you find that your thinking clears up. But your brain also needs oxygen. It runs on just oxygen and glucose. If your chest is stiff (from microfibers) you can't blow off the carbon dioxide you produce, which settles in the bottom of your lungs, because it is heavier than oxygen. Instead of picking up fresh oxygen, your bloodstream picks up stale carbon dioxide and carries it to your brain. Your brain ends up starving for oxygen. This is why you feel energized when you go for a brisk walk, run, swim or game of tennis. The movement of your body forces you to increase the amount your expand your rib cage, so that you can take in more oxygen for your muscles. But you also blow off the carbon dioxide you produce. This added oxygen to your brain gives you that 'invigorated' feeling your get after exercise. But what about the other 23 hours in the day? When your chest is tight, you are not blowing off carbon dioxide and your brain is suffocating. Not enough to alarm you. Just enough to make you sub-par, which is why so many people feel that they have to drink coffee to 'wake up'. We know that releasing microfibers improves the performance of the brain, because psychologists have told us so. Two psychologists tested our clients before and after their Microfiber Reduction program. What they found astounded them. All of our clients thought more positively about the world, and about themselves. They reported better self-esteem. The psychologists were amazed. The improvements were dramatic--and more than any kind of psychological therapy reported in their literature searches or personal experience. All because their brains were finally getting enough oxygen--even in their sleep. Parents who have brought their children to us for our swim camps report that their grades improve after we release microfibers in their chest, which improves their breathing. Of course, they swim faster as well. Computer programmers have reported that they can solve problems faster. One received two promotions and three raises in pay during his Microfiber Reduction program. It does last. Our clients find that ten years later, they are just as flexible as when they completed our program. Microfibers form as a result of stress and tension. When you have an injury or overuse, or just a stressful situation, the first thing you do is tense your muscles. Often, you will be unaware of this tension, as it is automatic. As soon as your muscles tense up, the connective tissue around them starts forming microfibers, because it thinks you have 'broken a bone'. Connective tissue is not very bright. It doesn't know the difference between a broken bone, a bump or a bad day. It also overreacts, forming more microfibers, in many cases, than is necessary. Once the injury, overuse or stress has past, the microfibers not only do not go away, they tend to accumulate over time, making people stiffer with age. Not only do microfibers physically bind the area together, but they also bind tension into place. Many people find that they are finally able to relax their tense shoulder muscles once we release the microfibers that have formed there. Most of our clients spontaneously relax their muscles as we release their microfibers. But some do not. For those clients who do not, we have developed Tension Reduction, special exercises to reduce tension in specific muscle groups. Other clients continue to deal with very stressful situations, in response to which they continue to tense their muscles. For these clients, we have developed Stress Reduction. As they reduce their stress response to those situations, they have less need to tense their muscles. A four-week program at Somax consists of Microfiber, Tension and Stress Reduction. We get at the causes of stiffness, not just the symptom (loss of flexibility). This is why the results last. Unfortunately our clients who are professional athletes cannot avoid injury, overuse and stress. For this reason, we work with professional athletes in a four-year program. In this way, we can release most of the microfibers and tension that they have formed in their career during their first year, and then we can continue to release the new microfibers, tension and stress that are a result of their occupation. But for the rest of us, as long as you do not get injured, or overuse your muscles, the results of your Somax program will last. We can even give you references to speak with who have completed our program 10-20 years ago. When I first came to Somax I was having serious lower back problems. They had become so severe that I was suffering with pains down my leg that were affecting my quality of life significantly. I was taking four 200mg ibuprofen tablets at a dose every four hours during the day in an effort to cope with the pain. When I played golf it would irritate my back significantly and would literally put me on the floor in pain. My pain began to subside as more and more parts of my body were loosened up with the Microfiber Reduction. Today I seldom have any pain in my lower back and virtually none running down my leg. My quality of life has improved significantly and I attribute this all to the Somax program. I was extremely flexible as a teenager and still had this image of myself being very flexible. When you initially measured my flexibility ranges, I was shocked at how much flexibility I had lost. I never dreamed that my ranges of motion were now so limited. Having seen pictures of people that you worked on and how flexible they became, I was cautiously hopeful. Before I started working with Somax, I only knew one thing: lifting weights would change my body and therefore help me improve my performance. What I didn’t know was that the muscles, although getting stronger, were also becoming glued together with microfibers, a mild form of scar tissue. In the summer of 2004, I was experiencing severe back pain and discomfort around my hips from weight lifting. This pain began to impact my performance as a professional golfer. I started doing Yoga, went to see different massage therapists and changed my workout routine to get some relief. Yet nothing seemed to ease the pain. I noticed during my stretching sessions (which would sometimes last 1 ½ hours) that many of my muscles just wouldn’t give. I would feel good for the next 4 hours, but by the time I cooled down the pain had returned. I also noticed very little improvement in flexibility from one session to another. I remember how frustrating that time was for me. During all the years of strength training and stretching, the various coaches that I worked with only taught me about the muscles. Never did anybody mention the connective tissue that surrounds them and what could go wrong with it. When I first saw the demonstration video of Microfiber Reduction, I was skeptical that this procedure would really help my problems. I have now completed my four-week program with Somax and I couldn’t be happier about the results that I have seen from their work with me. They have enabled me to work on my game with no pain in my body. They have improved my flexibility in areas I didn’t even know were of any importance to golf. I have never seen a program that is as individualized as this one and that carries as many benefits. I have improved all of my statistics on Tour by becoming more flexible and tension free. One example of the benefits this program has given me is visible improvement in my putting. My head used to move a lot during my stroke. I would work on it for hours with little result. After the first year of my Somax program, I have improved my LPGA putting statistics from 1.86 ( T 112) in 2004 to 1.81 ( T 27) in 2005 (Putts per Green in Regulation) and my head movement has decreased dramatically. I have also quadrupled my income as a player, and won my first tournament in two years, both of which have made me very happy. As Somax got rid of the microfibers between my muscles, it enabled me to move the way I know I should move. This is partly what has increased my level of confidence as an athlete. Tension Reduction is another bonus of the program. I noticed that my focus and concentration levels have improved by releasing tension. We recently looked back over the many athletes we have worked with over the past 38 years and made quite a discovery. Those who had completed our four-week program of Microfiber Reduction had all improved their flexibility at least 100% in one or more ranges. All of them. At least 100%. And, as you can see in the examples above, some much more than 100%. This is why we can guarantee that you will improve your flexibility 100% in one or more ranges with our four-week Microfiber Reduction program, or we will refund your money, no questions asked. This means that even though you have tried stretching for years, you can now be assured of improving your flexibility so that you can enjoy the sports and activities you love, and enjoy the benefits of a full flow of fresh oxygen to your brain. There are a few situations where we cannot guarantee a 100% improvement. If you suffer from polio, Parkinson's, myasthenia gravis, stroke, or some disease of the connective tissue, we can only say you will see some improvement, certainly more that you will get from stretching. If you are stiff because of a head injury, you will improve your flexibility with Microfiber Reduction, but we cannot guarantee it will be 100%. If you are over the age of 75, you will improve your flexibility beyond what you can get from stretching, but we cannot guarantee it will be 100%. We recommend you order our demo video on Microfiber Reduction. In it you will see a 52 year-old increase his hamstring flexibility 45 degrees in just the first hour of his Somax program. We will also send you letters from our clients, and directions showing you how to measure your flexibility for your sport and breathing. Once you measure, you will be amazed at just how much flexibility you have lost. You can order the special demo package by calling us at 1-800-227-6629. The package is only $20, which includes shipping and handling, and is refundable with any of our programs. If you like what you see, we then recommend that you start with a three-hour evaluation. We will videotape your mechanics (golf, swimming, running, tennis) and measure your Range, Sequence, Speed, Separation and Alignment--all the important factors that determine your success in your sport. Then we will videotape and measure the ranges you need for your sport or activity, including your breathing ranges. Then we will release some microfibers. If we can help you, you will see an immediate and dramatic improvement in your flexibility. At that point, we can confirm whether or not we can offer you our 100% money-back guarantee for our four-week program. We also recommend that you look at the results of all of our clients posted on this website. After your evaluation, we can give you some names and phone numbers of past clients to call so that you can discuss the results of our program. Some of our references will be people who have completed our program 10-20 years ago, so that you can learn about the long-term results of Microfiber Reduction. Call us at 1-800-227-6629 (or 415-435-9880 if you outside the US). We are happy to discuss your situation and what you can expect from our program.